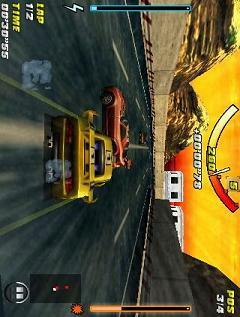 Raging Thunder - Buckle up Take on the most adrenaline pumping 3D street racer ever on a handheld platform. Raging Thunder features stunning, console quality 3D graphics, single or multiplayer gaming! Speed 3D Racing - Brand new races with excellent graphics, vivid special effects and well-thought multiplayer mode. Several characters to choose from, large vehicle fleet and a shop for buying upgrades are waiting for you. Get behind the wheel and compete for the status of the champion. Unleash your skills and drive like a maniac!